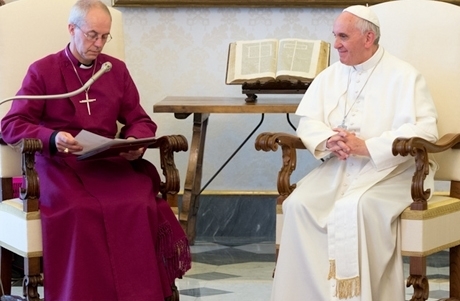 [Lambeth Palace] The Archbishop of Canterbury Justin Welby will meet Pope Francis in Rome next month. The visit, from 14th to 16th June, will focus on the joint modern slavery and human trafficking initiative launched by Archbishop Justin and Pope Francis earlier this year. The Archbishop will visit the Anglican Centre in Rome and hear about the new international Anglican Roman Catholic Commission on Unity and Mission website, which will be launched at this time. He will also see a church-based refugee project, visit the Sant’Egidio community mission and hear about poverty projects. He will also meet members of the international ecumenical Catholic foundation Chemin Neuf, four of whose members took up residence at Lambeth Palace earlier this year, and visit the Monastery of San Gregorio al Celio for ecumenical vespers. The Papal meeting will take place during the final morning of the visit. Archbishop Justin previously met the Pope at a private meeting last year.